Dr. Redonna K. Chandler returned to NIDA in June, 2108 to serve as the Director of the AIDS Research Program. 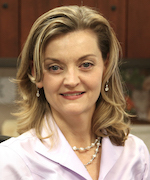 She brings extensive scientific and organizational leadership, and recently served as the Deputy Director for the Division of Clinical Innovation at the National Center for Advancing Translational Sciences providing leadership to the Clinical and Translational Science Awards Program. Dr. Chandler has been at the NIH since 2002, serving in positions of increasing responsibility and leadership at the National Institute on Drug Abuse. Prior to joining NCATS she served as the Acting Director for the NIDA’s Division of Epidemiology, Services, and Prevention Research and Chief of the Services Research Branch. She worked for the Department of Justice from 1996-2002, directing large drug treatment programs. Her areas of expertise include research with individuals involved with the criminal justice system, clinical trials, improving adherence to drug abuse treatment and HIV care, and implementing evidence based treatments into routine practice settings. She has authored numerous articles and book chapters. She earned her Ph.D. in psychology from the University of Kentucky and is a licensed psychologist. As a clinician she has treated those struggling with addiction and serious mental health issues. An interesting piece of trivia – she once trained with the FBI and served as a member of a hostage negotiation team! 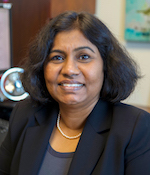 Dr. Vasundhara Varthakavi (Kavi) is the Associate Director of the AIDS Research Program. Kavi comes to us from NIAID where she served as a Scientific Review Officer (SRO) in the AIDS Research Review Branch. As an SRO, she managed the AIDS Research Review Committee and multiple Special Emphasis Panels that conducted peer review of single- and multi-project grant applications and R&D contract proposals covering a broad range of scientific topics and technologies relevant to HIV/AIDS, HIV/TB, and other infectious diseases. Kavi was trained as a veterinarian and holds a doctorate in Microbiology from the College of Veterinary Sciences at Kansas State University. Before joining NIH, she served as an Assistant Professor in the Department of Pediatrics at Vanderbilt University Medical Center where she was engaged in teaching and research activities. Her expertise includes HIV Assembly and pathogenesis, virus-virus and virus-host interactions involving HIV-1 and HHV-8, herpesvirus pathogenesis, immune responses to viruses and vaccines, immunology, molecular biology, virus replication assays, molecular diagnostics, and assay development.